After a long siege, the empire of Asmidan has conquered Cardis and the Conclave of Law has been sent by the Emperor to establish the new rule. The city is in disarray and several factions struggle for power behind the scenes. The former Queen is using her influence to gather allies in an effort to help her son claim the throne. The Order of the Coin, a group of wealthy individuals, wants to rise to power ensuring the gold keeps flowing. The Asmidan’s Church desires to seize control of the newly conquered city by using the feared Inquisition to sway whoever opposes it. 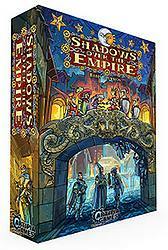 In Shadows over the Empire players take the role of leaders of four factions in a struggle for control of Cardis. They must influence various personalities and have them do their bidding. Loyalties are constantly changing and great allies become mortal enemies in a city filled with desire for dominion.